Best Apartment I Ever Sold invites our agents to share the unique story of their best selling experience to date. 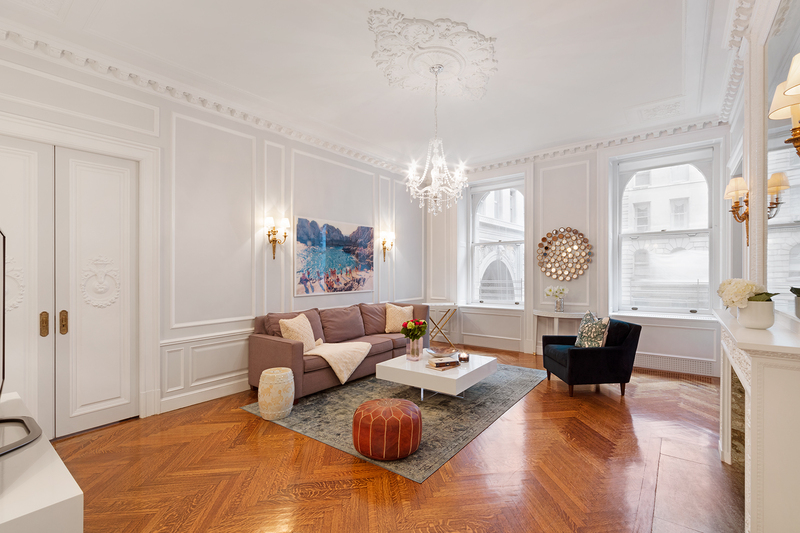 This week, learn why Julie Messeca’s sale at 390 West End Avenue, 3KS is her best one yet. If I had to pick just one apartment as the best one I ever sold, to date it would be apartment 3KS at 390 West End Avenue. The Apthorp is a unique condo building, rich with old New York characteristics and charm – walking into the building’s courtyard feels like stepping back in time. The building is one of New York’s most cherished landmarks, renowned for its Italian Renaissance Revival architecture and private port. The fully staffed four lobbies are entered through the beautiful courtyard which is gated on both sides. With every listing you look for what makes that home special and appealing to buyers. This particular one had every original detail expertly restored or replicated including the unparalleled original plasterwork, marble mosaic flooring, ornate fireplace, herringbone floors and the soaring detailed ceilings. We focused the marketing images and description on the unique living experience in one of New York City’s landmark buildings in the heart of the Upper West Side with ornately restored pre-war charm. The details in the meticulously renovated 2-bedroom, 2.5-bathroom, pre-war home spoke for themselves. Within a day of it being listed through focused marketing, we had an offer for our seller at $2,660 per square foot in a tough luxury market where apartments could sit on the market for months, if not more. We focused on the unique qualities of the apartment and building characteristics for the buyer to see the value in this special home.